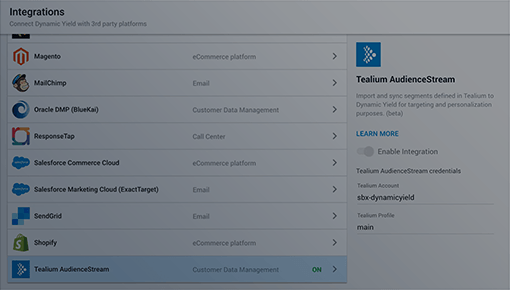 Personalize your entire customer journey with Dynamic Yield’s integration with Tealium AudienceStream. 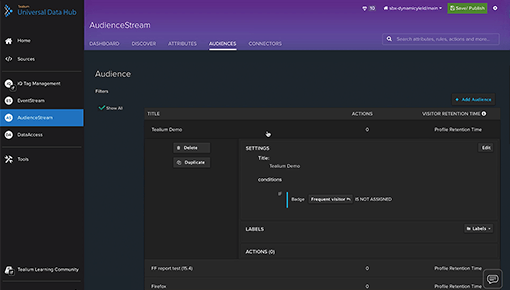 With this integration, customers can leverage all of their valuable Tealium AudienceStream data for deeper analysis and further data enrichment. Onboard your first-party customer data from Tealium to achieve the richest view of your customer, create a true 1:1 experience across the customer journey, and achieve real-time personalization at scale using Dynamic Yield’s powerful testing and personalization engine. Unify valuable first-party data segments captured by Tealium and your behavioral user data captured by Dynamic Yield to create a robust, comprehensive datasets that power your personalization efforts. 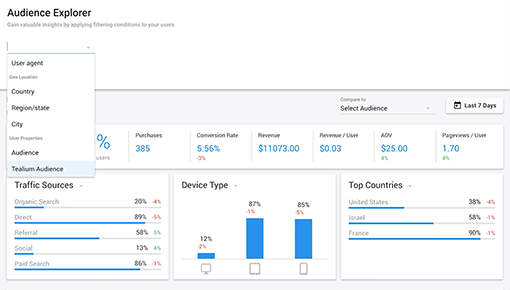 Easily onboard Tealium AudienceStream customer profiles and data segments to target users with personalized tests and activations. Automatically sync proprietary Tealium segments with Dynamic Yield in real time with a single click after unifiying data in Tealium AudienceStream. Optimize experiences for time-sensitive shoppers, VIP customers, and bargain hunters. Personalize the homepage of an online sports retailer according to a fan’s favorite team.